I have spent the majority of the last two months in Seville. There is so much history and beauty here; it is truly a hidden gem in southern Spain. Christopher Columbus sailed from here to find the Americas. When he returned all that came to and from the Americas was taxed through Seville; they had a big golden age and built many beautiful monuments. It is a truly romantic city; I smile as I pass young love birds canoodling on fountains. It seems that you can always spot someone who has just arrived rolling their suitcase with a big smile on their face. It feels good to be in a place where everyone feels so happy to be visiting. My first recommendation when traveling is to find out if the city has a free walking tour, if yes, go on it! It is a great introduction and can help you decide what you really want to see. 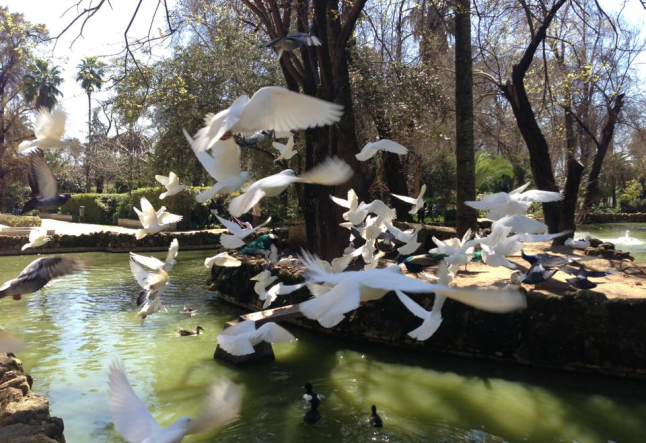 My slice of heaven is the largest park in Seville, Parque Maria De Luisa. 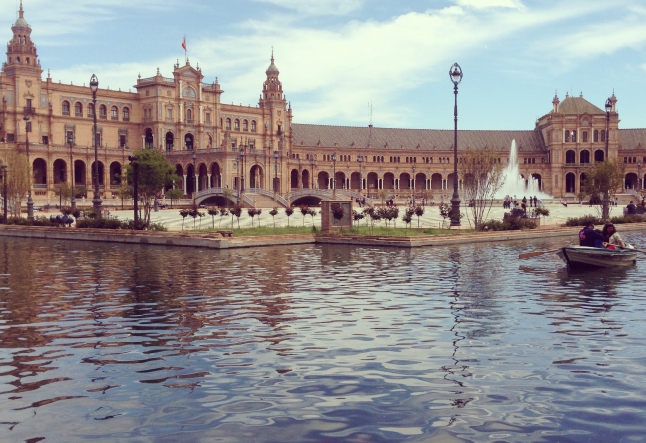 This park is attached to Plaza De España, which is truly awe-inspiring. Scenes from many movies such as Star Wars episode I and II were shot here. The combination of Parque Maria De Luisa and the Plaza De España is like walking through a fairy tale, complete with horse drawn carriages and all. Imagine half a mile of gorgeous tiled fountains, lush plants, orange trees and flowers. I found a pond with ducks, geese, turquoise peacocks, all white peacocks and swans all on the same little island! If you love beautiful parks and nature, this one really tops the charts. The architecture in Seville is stunning and I feel like I can wander the cobble stone streets through windy alleys for hours. The city is not build on a grid since they wanted to be able to escape if there were any invaders. It makes it fun to mosey along the twists and turns of the small alleyways. 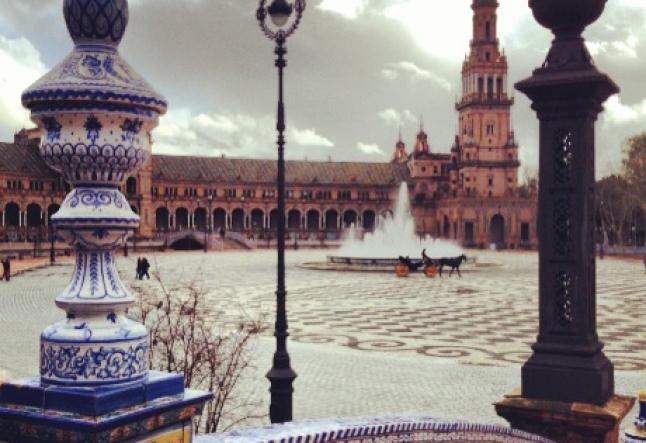 It seems as though you would get lost, but Seville is not too big. I always find that I end up right where I was supposed to be and I can find my way home, just look for the Giralda! The Giralda is one of the largest churches in the world, with a stunning tower that was completed in 1198 and can be seen from all over the city. This church is a massive, truly incredible example of Gothic and Baroque architecture. I love sitting on the fountain in front of the Giralda tower as people stroll on by, is truly an enjoyable past time that puts me in right into presence. 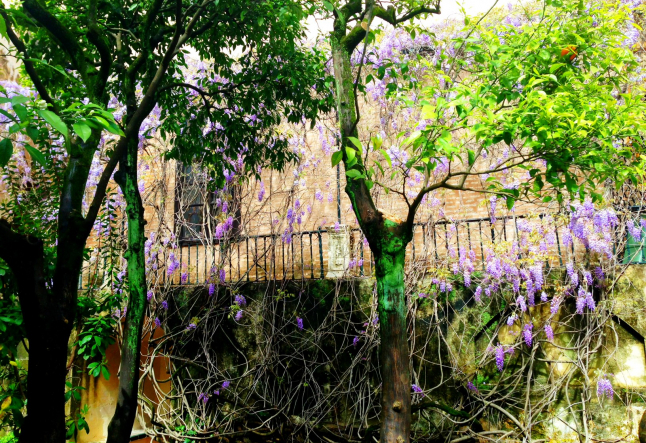 The Alcázar of Seville is the oldest royal palace that is still in use in Europe and was initially a Moorish fort. This romantic palace is filled with Moorish archways; the detail in the design is something you can enjoy some time marveling over. The gardens are also colorful and quite impressive. The Alcázar is near The Giralda and was registered in 1987 by UNESCO as a World Heritage Site, along with the Seville Cathedral. The Spanish enjoy their earthly pleasures and some do indulge in quite a bit of alcohol, cigarettes and pork. Most all of the restaurants are tapas style- which just means small plates. Not everyone in Seville speaks English, which is actually pronounced Ingles in Spanish. Several of the restaurants I have tried did not have many veggie options. If you are veggie or looking for veggie selections, I have learned a phrase that helps: Yo soy vegeteriana. No comer Carne. ¿Qué puedo pedir? This means: I am vegetarian. I do not eat meat. What can I order? Want to practice yoga and Spanish at the same time?! Go to a yoga class in Seville, the instructor will teach in Spanish. I found this a great way to brush up on my Spanish yogi lingo while getting a nice practice in! Here are the names of two studios: Sadhana Seville and Centro Integral de Yoga. My highest recommendation, if the weather is nice during your visit to Seville, is to bring your yoga mat to Parque Maria Luisa. 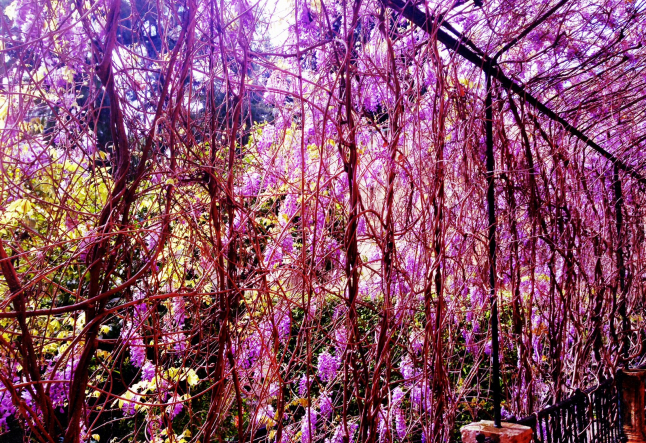 What could be better than practicing surrounded by beautiful nature in lush gardens?